Here's the side of the piece. Here's the front of the piece (and you can see the chip on the bottom of the beak). 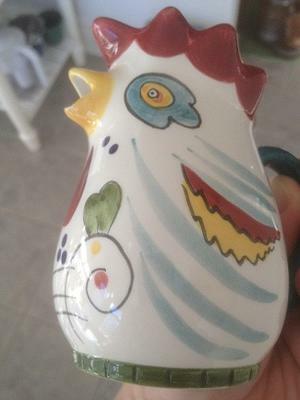 Hello, My mother has had a set of pottery roosters (pitcher, sugar dish, creamer, etc.) for a long while. She's used them for every holiday, family get-together, etc. and she even pulls them out just when it’s just the two of us having coffee. She's always been super proud of them. I have no idea how long she's had them, but for at least 15 years. Recently, someone (more than likely my father or younger sister) stuck the creamer in the dishwasher, and the beak of the creamer chipped. My mother told me, first, how disappointed she was that it was chipped, and second, how she really wanted a replacement. For Christmas, I decided I would look into purchasing it for her. I really wanted to surprise her, so I’ve been trying to see if I could figure out how to buy a replacement without interrogating her where she got it, when, etc. If all of my efforts to find it on my own don’t work out, then I’ll probably try to see if I can learn more from her where she got it, but I’d be much more excited about surprising her. This is where I need you guys! Please help me surprise my mother! 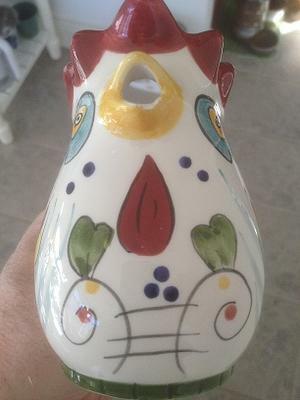 one I've found was up on Overstock.com and is Raffaellesco Italian Ceramic Rooster Pitcher (http://www.overstock.com/Home-Garden/Raffaellesco-Italian-Ceramic-Rooster-Pitcher/1021217/product.html). Problem is, it's a pitcher, not a creamer, and they don't seem to offer a creamer version in that same style. The style of this one still isn’t a perfect match (like, isn’t that a dragon on the side or something? ), but it might be able to do if I couldn’t find the original. Then I turned to the mark on the bottom. It really just looks like someone's initials (C.A. ), but the dots between the C and the A are too high to really be periods, so I tried to research it as C-A- or as C*A* to no avail. The initials pulled up plenty of California pottery artist sites, but if it’s a California based potter, I don’t know why he or she’d be so vague about who did it! I then tried looking up different pottery markings, but most professional ones seem to include more information than this one does (like full company name, city location, etc.). If anything, I’m not an expert. This is my first attempt at investigating pottery markings, and I may just need a proper schooling. If you all can help, I’d greatly appreciate it, and so would my mother who would love to have a complete set of intact rooster pieces again! 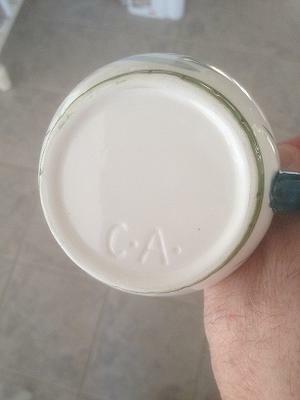 Comments for Pottery Mark Query - "C-A- on the bottom"
Did you ever get an answer to this? I have a piece with the same exact marking. Never got a reply unfortunately.